Dr. Tamm moved to the University of Virginia (Charlottesville) in 1990. He is currently the Andrew P. Somlyo Distinguished Professor in Molecular Physiology and Chair of the Department of Molecular Physiology and Biological Physics. 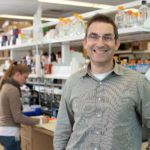 Dr. Lukas Tamm directs the Center for Membrane and Cell Physiology at the University of Virginia, which currently comprises approximately 40 tenured and tenure-track faculty who are affiliated with eight Departments in the Schools of Medicine, Arts & Sciences, and Engineering & Applied Science of the University of Virginia. Current research interests include studies on virus entry into cells by membrane fusion, neurotransmitter release at synapses by exocytosis of synaptic vesicles at nerve termini, and the study of the structures of bacterial outer membrane transporters by NMR. Methods development has always played a central role in Dr. Tamm’s research. Dr. Tamm’s lab is at the forefront of solving membrane protein structures by NMR, developing single molecule tracking and single vesicle fusion technology in supported membranes, and developing methods to study the composition, dynamics, and signaling in lipid “rafts”. Dr. Tamm to date trained 20 graduate students and 26 postdoctoral research associates. Many of these currently hold academic positions in the US and abroad. Many others are employed as research scientists or directors of research in pharmaceutical and biotech companies or work in the public sector. Dr. Tamm received the Humboldt Research Award from the Humboldt Society. Dr. Tamm has published more than 170 research and review articles and edited a book on Protein-Lipid Interactions (2005). He also guest-edited several special journal issues, and served as an Associate Editor of Biophysical Journal and as a member of the editorial boards of several other biological sciences journals. He organized several meetings in the area of Membrane Biophysics. He served on and chaired multiple US and foreign grant review and advisory panels. He served as Secretary of the Biophysical Society and as President of the Biophysical Society where he oversaw the development of the society’s current 10-year strategic plan. In his role of president of a major scientific society he advocated on Capitol Hill for increased research funding.